For anyone who has ever wished for an onsite coach to keep them focused during a writing stint, your dream (or nightmare) has come true. 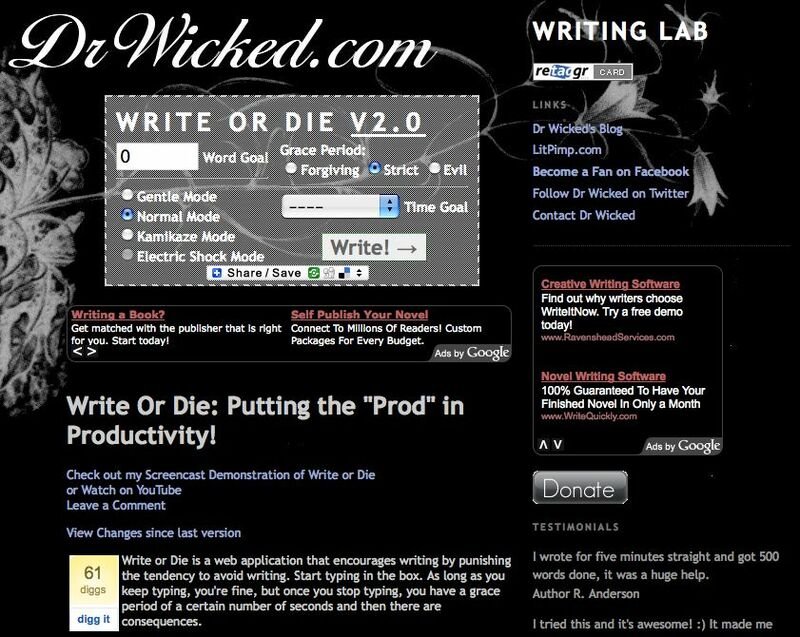 Meet Write or Die from Dr. Wicked’s Writing Lab. You select a target word count or time duration, as well as the strictness level you desire, and begin typing in the writing box. If you stop typing — perhaps because you started surfing the web or checking Facebook — Dr. Wicked will unleash a systematic “reminder” arsenal to get you back to the page and start typing. At his most evil, Dr. Wicked will actually start erasing what you’ve written — which should certainly be a negative enough consequence that you won’t let it happen! When you’ve reached your goal, you can copy and paste your text into a Word document, or use the program’s clipboard function. Write or Die is a web application that encourages writing by punishing the tendency to avoid writing. Start typing in the box. As long as you keep typing, you’re fine, but once you stop typing, you have a grace period of a certain number of seconds and then there are consequences….A tangible consequence is more effective than an intangible reward. If I don’t write stories for class, I will receive scorn from my teacher and a bad grade in the class. If I don’t write my own stories I am only disappointing myself. I experience perpetual disappointment in myself so I’m kind of used to it. Add to that the fact that I simply have neither the self-discipline to write consistently on my own nor the capacity for self-deception that would enable me to create artificial deadlines. That is how Write or Die was born. Kamikaze Mode: Keep writing or your work will unwrite itself. These consequences will persist until your preset conditions have been met (that is, your time is up or you’ve written you wordcount goal or both). This text box is not a word processor, it is not for editing, the way to save is to select all of the text, copy and paste into your own text editor. The idea is to separate the writing process and the editing process as much as possible. This is aimed at anyone who wants to get writing done. It requires only that you recognize your own tendency towards self-sabotage and be willing to do something about it. If you’re sick of saccharine writing advice that no one could honestly follow and you want a real method to getting work done. See for yourself! And thanks in advance, Dr. Wicked. this defiitely would not work for me! i type slowly, esp one-handed w/baby; i pause and reread for continuity; i start and stop b/c well, life; and i would swear my freaking head off at anything that would pop up punishments and erase what i’m carving out of my depleted and overstimulated brain! For someone like me, this is a terrific tool. I very much *need* to separate the writing from the editing. At least when I’m writing fiction, I need to just keep the hand moving, a la Goldberg, and this is a great way to maintain that focus. I probably couldn’t do it for more than twenty minutes. I’m going to experiment and find out. kamikaze mode is exactly what it would be for me – creative suicide. i have enough neg voices in my head to contend with, thanks! lol! i think this would remind me of particularly bad teacher/professor relationships of old. Sadly I am unable to make house calls, but anyone who is intimidated by Write or Die should contemplate the larger, even less well-defined intimidation that a blank page represents. I myself am petrified by all the possible places that a story might go. I edit too much, worrying that what I write will be terrible. That’s why I made Write or Die, and judging by the response I’ve had, a lot of people are surprising themselves with the contents of their own brains. It helps to coax out the writer inside you, the one who is usually crushed beneath the jackboot of your internal editor. The need to hold a baby in one arm is definitely a hindrance, but one of the things that I design it for is to write for very short periods of time just to see what you can do. I know babies sleep in 20 minute increments with crying in between, so just try 20 minutes and lower the pressure on yourself. Your inner writer will thank you. ok, i tried it after your response, dr w. i can see how it would help some, but not me – i have the pressure pretty low these days, and that car horn noise goes thru me like nails on a chalkboard. more pressure than i need. but thanks anyway!